The International Monetary Fund isn't buying what President Trump is selling on tax reform. The IMF released economic forecasts on Tuesday that assume Trump will not deliver an overhaul of the U.S. tax system this year or next. The group said in its latest Global Economic Outlook that it expects U.S. policies to remain unchanged because of "significant policy uncertainty." In April, the IMF's forecast had assumed a stimulus boost driven by "then-anticipated tax cuts." The U.S. economy is now predicted to grow by 2.2% in 2017 and 2.3% in 2018. That's slightly faster than the IMF expected in July, but slower than its April forecast of 2.3% growth this year and 2.5% in 2018. Trump has promised growth of 3% in his first term, a rate the IMF has previously described as being "extremely optimistic." 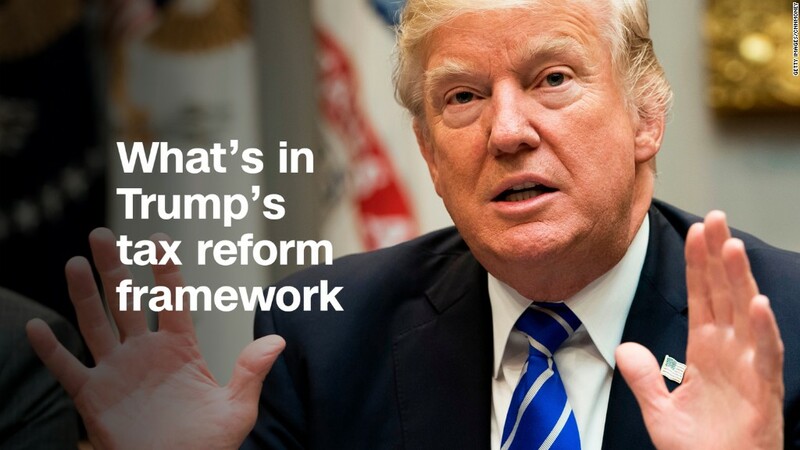 Trump unveiled a framework for tax reform last month, calling for sweeping tax cuts and a simplification of the tax code. He framed the effort in a speech as a historic opportunity. Republicans are well on their way to overhauling the tax code, but there are doubts that Trump and congressional leaders will be able to find a formula that will lead to the major policy reform becoming law. Party schisms, red lines and inevitable local interests are already coming into sharp view. Some House members, for example, are worried that the plan scraps certain deductions. In the Senate, Bob Corker, a Republican from Tennessee who has emerged as a harsh critic of the president, has said he doesn't want the tax package to add to the deficit, a fiscal hard line that may be tough to comply with. Sen. Rand Paul, another Republican, has also signaled his concerns with the plan. The IMF has a rosier outlook on global growth, predicting an expansion of 3.6% this year and 3.7% in 2018. Canada, Mexico and Russia were among the countries that saw their outlooks lifted the most, while India suffered a downgrade. The IMF expects Canada and Russia to benefit from more stable oil prices. It predicted that Mexico will keep its economy on track despite uncertainty caused by the renegotiation of NAFTA. The fund blamed India's 0.5 percentage point downgrade for 2017 on "still lingering disruptions" from its shock currency swap initiative, and the overhaul of its tax system. However, it said that tax reform will help India grow above 8% in the medium term. -- Lauren Fox contributed reporting.